Once tasted on the other side of the world, but never forgotten, Fine-Dining-HH shared his version of a Peruvian ceviche with us. The recipe combines tender fish, spicy chili peppers, tart citrus juices, bright mint, and fresh cilantro—a vibrant combination of flavors that we simply couldn’t resist for our community pick of the week. Ceviche is a seafood dish popular throughout Latin America that marinates fresh fish in citrus juice (usually lemons or limes) and mixes it with a variety of fresh herbs and finely chopped vegetables. This particular ceviche is special because of its traditional selection of ingredients inspired by a real taste of ceviche in Peru. The recipe stays true to the classics, using chili peppers, fresh cilantro and mint, and lime juice, but there are tons of ways to make it your own. 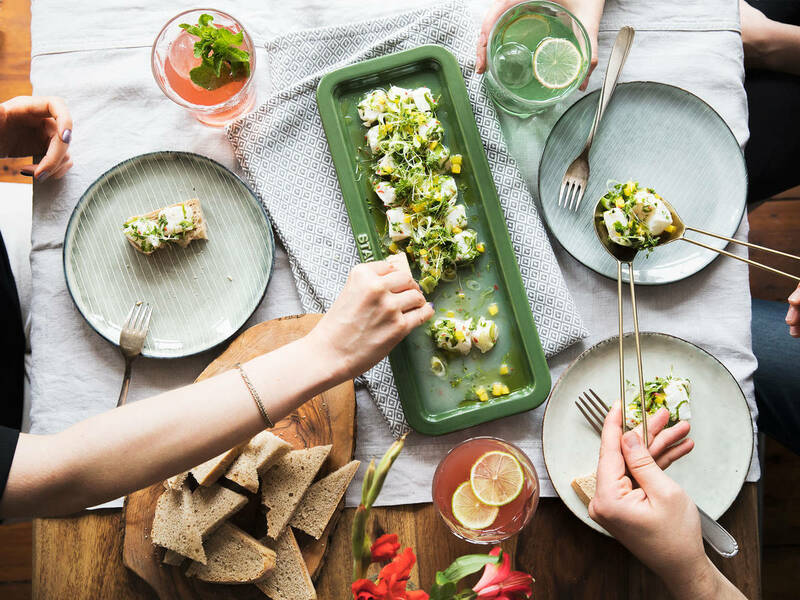 This ceviche brought summer-by-the-sea vibes to the Kitchen Stories test kitchen. Our hungry team praised the recipe as “like homemade haute cuisine” and “everything a ceviche should be”. If you’re looking for new ways to wow your family or friends or want to serve a stylish side dish at a dinner party for curious friends—this is the perfect recipe for you! First and foremost, it’s crucial to use the freshest fish you can get your hands on. The fish isn’t cooked, a process that would normally kill off bacteria–but don’t worry! It’s not raw either, as the citrus juices break down the protein in the fish, causing a firm, semi-raw texture, and irresistible taste. Another key is not to marinate the fish too long. Between 15 minutes and half an hour should be perfect. Fine-Dining-HH’s original recipe calls for Atlantic wolfish instead of cod, but you could also use turbot, haddock, or sea bass, even shrimp, scallops, or squid (ensure you blanch or parboil crustaceans first). Instead of lime, why not experiment with lemon or grapefruit juice, and try avocado, corn, or sweet potato to flavor your ceviche. Serve with crackers, tortilla chips, lettuce, or toasted bread—divine! You’ve created a recipe that takes you right back to your last summer holidays? Why not share it with the Kitchen Stories team and our hungry community! Simply send your recipe to community@kitchenstories.com.